Editor’s Note: Understanding how and why we age has long puzzled scientists. One way to study this question and explore the molecular mechanisms mediating longevity is by using the nematode C. elegans as a model system. 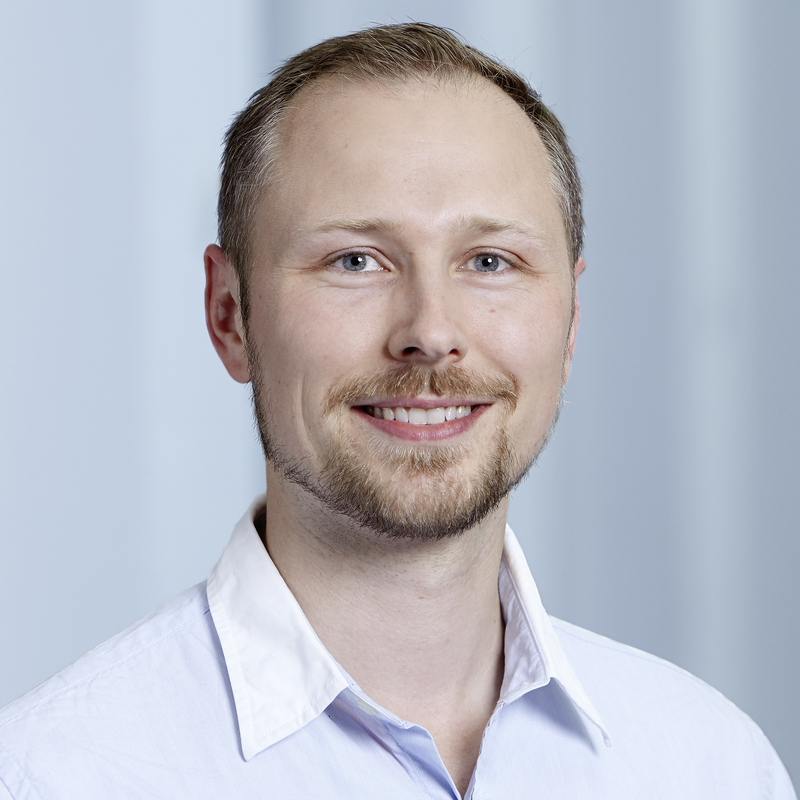 Collin Ewald, who recently started his own lab in the Department of Health Sciences and Technology in Zurich, Switzerland, and Keith Blackwell from Harvard Medical school spoke with Benchling about two new methods that can control for dauer-mediated processes when studying insulin signaling and longevity in C. elegans. Benchling fosters collaboration and promotes new methodologies and standardization in science. If we could help share your research, let us know. The question of how and why we age has been a longstanding mystery. Scientists used to think that random wear and tear to the body caused aging. However, the emerging concept on aging now suggests that it is a dynamic process, influenced by our genetic background, environment, and numerous other factors. In fact, two groups of scientists led a breakthrough in the molecular investigation of aging more than 20 years ago and showed that a mutation in a single gene can double the lifespan of an organism [1-2]. Since then, scientists have identified several ways to slow aging -- termed longevity interventions. Some of these longevity interventions include reducing insulin/IGF-1 signaling, TOR signaling, protein translation, germ stem cell signaling and dietary intake . However, we still do not understand why these interventions lead to longevity. To gain insight into how longevity interventions ensure a healthy long life, we set out to study how one of the most studied longevity interventions, reduced Insulin/IGF-1 signaling (rIIS), increases lifespan in the nematode Caenorhabditis elegans . C. elegans has a short lifespan of about three weeks. C. elegans is easy to cultivate. You can track genetic manipulation easily and its genes are well characterized. Genes in C. elegans are highly conserved across species, including humans . For example, reducing rIIS increases lifespan across species from C. elegans to fruit flies to mice. Notably, single nucleotide polymorphisms in the insulin/IGF-1 pathways have been associated with longevity in humans . Although C. elegans provides a good system for identifying novel mechanisms that promote healthy aging under rIIS conditions, the C. elegans rIIS pathway also regulates a developmental arrest stage that can be activated improperly during adulthood [4,7]. This developmental arrest stage is called dauer, the German word for "endurance". Although dauer itself can contribute to longevity, when studying rIIS-mediated longevity in C. elegans, this arrest stage becomes problematic. Distinguishing between rIIS-mediated longevity and rIIS activated dauer effects is an important aspect to consider when identifying mechanisms behind rIIS longevity. 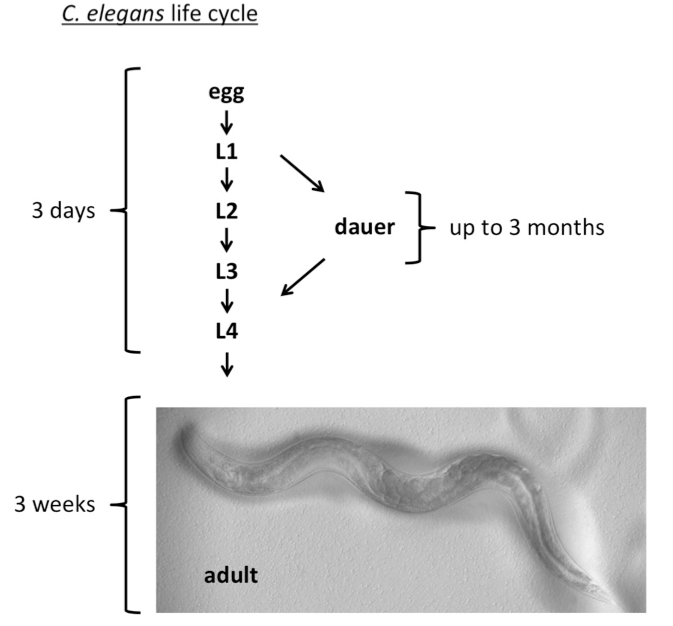 Under favorable conditions, C. elegans develop from eggs through four larval stages (L1-L4) within two to three days and in the laboratory show an adult lifespan of three weeks (Figure 1). By contrast, under harsh environmental conditions, C. elegans develops into dauer larvae that can survive for more than three months and withstand toxic insults and starvation (Figure 1). Figure 1. C. elegans life cycle. During development, low insulin/IGF-1 signaling forces animals into dauer even when plenty of food is available . In C. elegans, the insulin receptor (InsR) and the IGF-1 receptor (IGF-1R) is encoded by the single gene called daf-2 . The daf-2 pathway is one of the most studied genes/pathways in C. elegans with more than 1000 publications according to wormbase and 22 hypomorphic daf-2 alleles . Mutations in daf-2 were isolated in genetic screens for mutants that develop into dauers at 25°C but develop into normal reproductive adults at 15°C. Interestingly, some of these daf-2 mutants, when grown at higher temperatures (20-25°C), show dauer-like phenotypes (reduced movement, reduced brood-size, reduced body-size, abnormal gonad), suggesting that aspects of the dauer program are improperly activated during adulthood (dauer condition). By contrast, these same daf-2 mutants grown at 15°C look like wild type and do not display any dauer-like traits in adulthood (non-dauer condition) . Importantly, daf-2 mutants are comparably long-lived across a broad temperature range (15-25°C) [4,7], suggesting that this improper activation of dauer-like traits can be uncoupled phenotypically. These observations led us to investigate the genetic basis of these dauer-traits on rIIS longevity. Our recent work has shown that there are two genetically distinct pathways of how reduced insulin/IGF-1 signaling can increase longevity: a dauer-dependent and independent pathway (Ewald et al. 2015). This raises the issue of how to separate these two pathways to identify rIIS downstream mechanisms while controlling for dauer-related mechanisms. Environmental temperature can influence the C. elegans’ lifespan. The standard laboratory cultivating and assay temperature is 20°C. Wild-type C. elegans maintained at 15°C live longer, and wild type maintained at 25°C live shorter compared to those grown at 20°C. For the commonly used wild type C. elegans (N2), 25°C is already a stressful temperature. At 27°C, about 10% of the wild-type C. elegans develop into dauer larvae, indicating harsh environmental conditions. The classically used daf-2 mutants (e.g., daf-2(e1370)) do not form dauers at 15°C, form a few dauers at 20°C, and form all dauers at 25°C . However, proportional to the temperature, the extension in lifespan of daf-2 mutants is the same [4,7]. Hence, performing the lifespan assay at 15°C avoids the activation of the dauer-associated pathway. Avoids dauer-related traits during aging such as reduced movement, reduced body-size, and reduced brood size. Cultivating temperature of 15°C facilitates harvesting L4 daf-2 mutants for lifespan assay at a similar rate as wild-type C. elegans, since at 15°C daf-2 mutants show no sterility, do not form dauers, and do not have a slowed developmental rate. The lifespan assay takes longer. Temperature-sensitive-alleles of other genes that need to be kept at 25°C cannot be used in combination with daf-2 alleles. 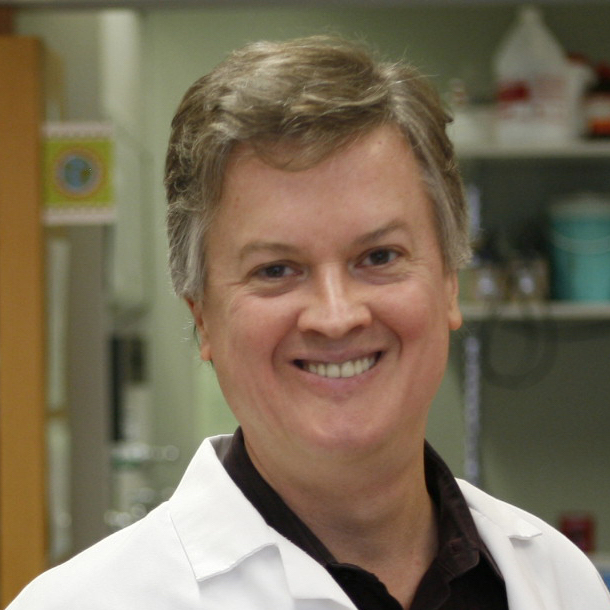 Depending on time of RNA interference, daf-2 may or may not be efficiently knocked-down. Knocking-down daf-2 by RNA interference (RNAi) starting on the first day of adulthood increases lifespan under all temperatures (15-25°C). However, applying daf-2(RNAi) during an earlier development stage does not lead to the formation of dauers [4,11] or the improper activation of the dauer-program during adulthood . This is because neurons, which play a crucial role in the decision to enter the dauer arrest stage, are refractory to RNAi feeding and daf-2 is presumably not or less efficiently knocked-down in wild-type animals when RNAi is given during development . Feeding C. elegans daf-2(RNAi) works during adulthood and avoids any contribution from developmental processes. daf-2(RNAi) works in almost any genetic background. Therefore, there is no need to perform laborious crossing to other mutants. RNAi bacteria are a different E. coli strain (HT115 instead of the normally used OP50). OP50 and HT115 have different nutritional content and affect the physiology of C. elegans. For example, wild-type C. elegans on HT115 has a slightly longer mean lifespan (~2 days) compared on OP50. The nematode C. elegans provides advantages to identify mechanisms for prolonging health and lifespan under reduced insulin/IGF-1 conditions. The C. elegans rIIS controls both dauer development and longevity, and the improper activation of the dauer-associated program during adulthood can mask other distinct mechanisms that are mobilized under rIIS. The protocol options (1 and 2) outlined above provide methods for avoiding these dauer-associated contributions. The way longevity experiments have been performed has broad implication on how we interpret lifespan assays and also mRNA expression profiling performed under conditions that activate the dauer program. Disentangling the dauer vs non-dauer contribution to rIIS longevity might help to reconcile the difference of differentially regulated downstream genes in daf-2 mutants. Importantly, studying the mechanisms of rIIS longevity in C. elegans can provide information for more relevant species. Interestingly, treating aged mice with "C. elegans-dauer-pheromone" extended the mice's lifespan and attenuated several of their age-associated pathologies . Hence, we speculate that each of these pathways (dauer or non-dauer) is likely to be of relevance to mammals, and it will be necessary to distinguish between them in order to understand their independent roles in mediating longevity. To learn more about how we studied the mechanism of rIIS longevity, please see our full manuscript in Nature. A video showing the dauer-associated reduced motility during aging in daf-2(e1370) mutants. A protocol for performing lifespan assays with C. elegans can be found by this article written by Amrit et al. .
A good introduction to C. elegans is found in this reference written by Corsi et al . We thank Rachel Beltzhoover for comments, Giulia Marthaler from ETH for making the headshot and Felix Marbet for making the lab logo. Friedman, D.B. & Johnson, T.E., 1988. A mutation in the age-1 gene in Caenorhabditis elegans lengthens life and reduces hermaphrodite fertility. Genetics, 118(1), pp.75–86. Shaye, D.D. & Greenwald, I., 2011. OrthoList: a compendium of C. elegans genes with human orthologs. K. M. Iijima, ed. PloS one, 6(5), p.e20085. Ziv, E. & Hu, D., 2011. Genetic variation in insulin/IGF-1 signaling pathways and longevity. Ageing research reviews, 10(2), pp.201–204. Riddle, D.L., Swanson, M.M. & Albert, P.S., 1981. Interacting genes in nematode dauer larva formation. Nature, 290(5808), pp.668–671. Kimura, K.D. et al., 1997. daf-2, an insulin receptor-like gene that regulates longevity and diapause in Caenorhabditis elegans. Science (New York, NY), 277(5328), pp.942–946. Patel, D.S. et al., 2008. Clustering of Genetically Defined Allele Classes in the Caenorhabditis elegans DAF-2 Insulin/IGF-1 Receptor. Genetics, 178(2), pp.931–946. Kennedy, S., Wang, D. & Ruvkun, G., 2004. A conserved siRNA-degrading RNase negatively regulates RNA interference in C. elegans. Nature, 427(6975), pp.645–649. Park, J.H. et al., 2014. Daumone fed late in life improves survival and reduces hepatic inflammation and fibrosis in mice. Aging cell, pp.n/a–n/a. Amrit, F.R.G. et al., 2014. The C. elegans lifespan assay toolkit. Methods (San Diego, Calif), 68(3), pp.465–475. Corsi, A.K., Wightman, B. & Chalfie, M., 2015. A Transparent Window into Biology: A Primer on Caenorhabditis elegans. Genetics, 200(2), pp.387–407.